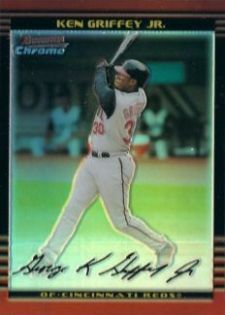 2002 Bowman Chrome Baseball is a strong follow-up to the classic set from 2001. Another stellar rookie card crop, including autographs from a pair of baseball's biggest names, lead the way. 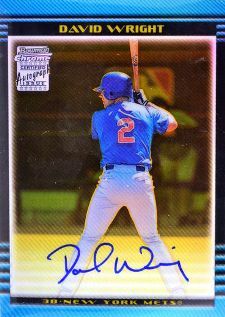 Both David Wright and Joe Mauer have signed rookies in the set, which have become some of the most sought after in the modern hobby. 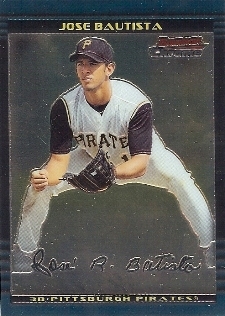 Other key rookie cards in 2002 Bowman Chrome Baseball include Jose Bautista and Rich Harden. Building a complete set of 2002 Bowman Chrome Baseball is a challenge. Inserted one per hobby box, there are 20 autographs to chase down, most of which are true rookie cards. The set also has a ton of short prints, which were inserted 1:3 packs. 2002 Bowman Chrome hobby boxes have 18 packs of four cards. They include a box topper redemption for one uncirculated rookie card from ThePit.com. Each rookie has 350 uncirculated cards and ten copies for each autograph. The redemptions have long since expired. Inserts are fairly straight-forward and revolve primarily around refractor parallels. Basic refractors aren't numbered, but short prints are serial numbered /500. Besides basic refractors, collectors can also chase X-Fractors (/250) and Gold Refractors (/50). The only other inserts are Rookie Reprints (20 cards, 1:6), which take basic Bowman cards from the past and recreated them on chromium foil. The Rookie Reprints are also paralleled as refractors (1:18). You forgot about Brandon Weeden, the star QB at Oklahoma State now. 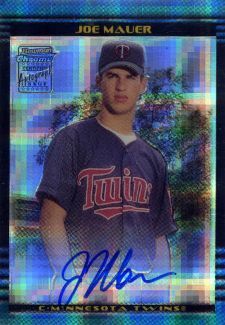 He has autographs in this product when he was a prospect with the Yankees, lol. Excellent addition Rich. Thanks for your input.